I’d heard of Dragons before, but this Dragon seemed different; when compared to the “standard traits” of both Eastern and Western. It’s talons and scales were of a Western Dragon, but it’s length and shape – were more befitting of an Eastern Dragon. Upon my “steed in white”, did I first battle this Dragon! I drew my sword, and prepared for “what may be”. 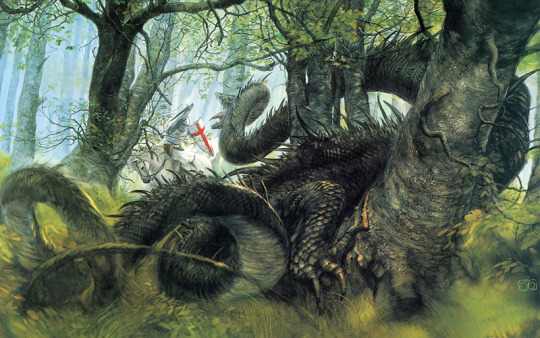 With the “weight of my helm”, did this Dragon – wrap itself around the Forest Trees. It’s “claws dug deep” – within the bark of a Tree. With the “clamour of my armour”, did this Dragon – become a Bastion of the Forest Trees. It’s “rows of teeth” – reaching for me! With the “strength in my arms”, did this Dragon – make it’s “war cry” at me. It’s “hungry tongue” – flicking out at me. For this Woodland Realm, was this Dragon’s Hoard. The green of the Leaves and the bark of the Trunks. The green of the Grass and the yellows of the Baron. The swaying of the Boughs and the windswept Blades. For this Woodland Realm, was this Dragon’s Lair. How long had it dwelt here? Know not I. Where did it sleep? Know not I. What of the Maiden that you’d “hoped to find” upon your Quest? Know not I. For this Woodland Realm, with it’s Forest Dragon, and his Hoard of Wood – was this Knight’s demise! This entry was posted in Fantasy Dragon Art and tagged adventurer, dragon, dragon hoard, eastern dragon, fantasy, knight, western dragon. Bookmark the permalink.